Possibly the most important part of your invitation is the envelope. It’s the first thing your guests see in their mailbox. What better way to make them burst with excitement to open your invite than a fancy wedding envelope! We have a huge selection of styles and colors, you will be sure to find the envelope of your dreams. Our envelopes are crafted from the finest paper yet me make them affordable for your special day. Our premium standard envelopes come in a variety of styles and colors. These include the popular A7, A2, Square, A6, Double, RSVP, and many others. 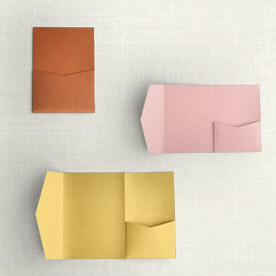 If you are looking for fancy envelopes look no further. These unique envelopes are available in dozens of styles and designs. Create a vintage or modern look including options with monograms! We offer envelope printing on all of our envelope sizes. Choose from black, colored, or white ink printing in both RSVP and full guest addressing! Accessorize your envelopes with a beautiful liner. 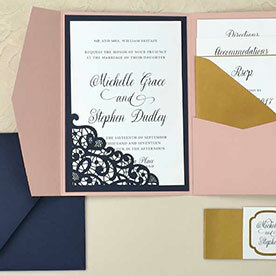 Our matching envelope liners are the perfect compliment for a gorgeous combination. Choose from pre-lined envelopes or DIY liners.